The graph presents the evolution of bitcoin price index from March 2017 to March 2019. The bitcoin price index is an average of bitcoin prices across leading global exchanges. The bitcoin index value for the end of March 2019 amounted to 4,081.22 U.S. dollars. More information on bitcoin and other crypto-currencies can be found in our Statista Report 2017. 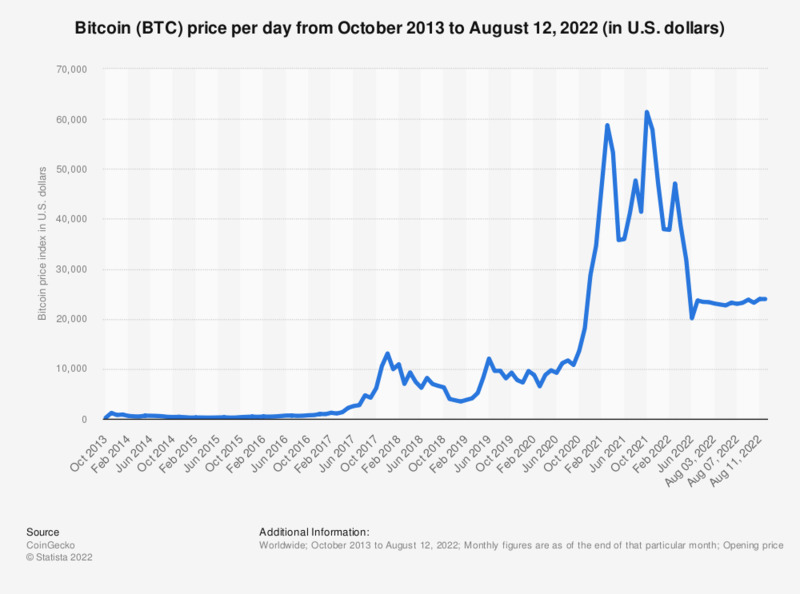 Since the Bitcoin creation in 2009, the price of this virtual currency remained quite stable until January 2013, reaching a maximum value of approximately 20 U.S. dollars. Afterwards a monthly price growth was observed until October 2013 when the price reached 198 U.S. dollars. This nearly tenfold increase in Bitcoin value proved to be insignificant in comparison to the price rally in November 2013, when the threshold of 1,100 U.S. dollars per coin was broken. After a period of downtrend which followed, Bitcoin price reached 1,349.19 U.S. dollars in April 2017. The number of Bitcoins in circulation has grown month on month and amounted to over 17 million in January 2019. The global value of Bitcoin amounted to approximately 10.1 trillion U.S. dollars as of January 2014 and was much higher than the value of other internet currencies such as Ripple, Litecoin or Peercoin. As of February 2019, there were 4,292 Bitcoin ATMs worldwide. In August of that year, the countries with highest number of Bitcoin ATMs were United States (2,289), Canada (623), United Kingdom (201), Austria (265) and Spain (66). There are still many concerns about using Bitcoin for online transactions and the security of this virtual currency is seen as one of the most important factors influencing the decision about the Bitcoin purchase. Bitcoin price index represents an average of bitcoin prices across leading global exchanges that meet criteria specified by the source. End of month closing prices. How interested are you in using Bitcoin for internet purchases with your phone, tablet, or laptop? What do you see as the top five benefits of using Bitcoin for your purchase/sale transactions? What features would make you interested in using Bitcoin for purchase/sale transactions? Have you ever heard of bitcoin? Are digital currencies, such as bitcoins, the future of spending online?